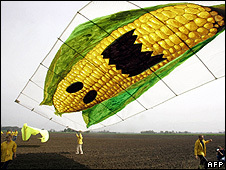 Germany is to ban the cultivation of genetically modified (GM) maize – the only GM crop widely grown in Europe. Monsanto’s variety, called MON 810, is resistant to the corn borer, a moth larva which eats the stem. Ms Aigner, a member of the conservative Bavaria-based Christian Social Union (CSU), said she had concluded that “there is a justifiable reason to believe that… MON 810 presents a danger to the environment”. The UK was among a handful of countries that supported the commission’s position, the AFP news agency reports. Germany was planning to sow MON 810 on just 3,600 hectares (8,892 acres) for this summer’s harvest, mostly in its eastern states.